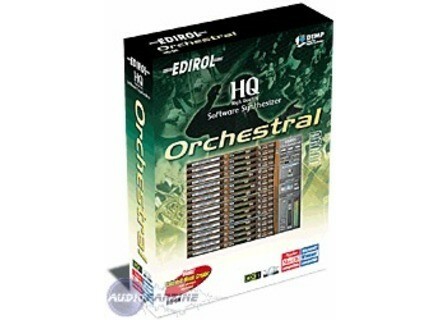 Edirols Orchestral is a plugin that creates orchestral instrument sounds. For me it installed quickly and easily, I didn’t have a single problem. I am using a cheap Dell PC and there where no compatibility issues whatsoever. Once you get Orchestral open you will see how easy it is to us, with the simple tool screen you can pick your instrument and edit it to whatever you desire. I haven’t even read the manual once, and I know pretty much every feature that orchestral has to offer, it is that simple. The computer I am using is a cheap Dell PC, running Windows XP. Orchestral works phenomenally is this setup, I have not had one problem with it, except for the fact that it really drains my CPU power, but that’s the computers fault, not Orchestral’s. The configuration is super stable, it has never caused a problem for me once, and it works great! I have been using Edirols Orchestral for about six months now, and I love it. There are many things I like about Orchestral, such as the varity of instruments, the in-depth editing capabilities, and the amount of sounds you get for the money. However my favourite thing about Orchestral would be how easy it is to use, it is as simple as selecting an instrument and playing. The only thing I dislike about Orchestral is the Pizzicato and Staccato sounds, they have way to much Sustain to really be called these things, and unfortunately, after trying many a time, I have found there is no way to get a good Pizzicato or Staccato sound. I did not try any orchestral plugins before, however I have used synths that produce some Orchestral instrument sounds, and Edirols Orchestral beats them by a long shot. In my opinion, you will not find a better Orchestra plugin for the price, however, if you really want a great Orchestra plugin, take my advice and save up for something made by East West, because they will blow Orchestral out of the water. Mickamix's review (This content has been automatically translated from French)" not buying outdated!" I no longer used as Obsolete. The sounds are outdated, it remains in the field of games for learning to write parallel, and make "orchestrations" fast unpretentious. The price is too expensive in relation to noise perf ... scam! We are almost in 2011 and is clearly exceeded. Equivalent to its hardware keyboards 2000s. obviously insufficient choice now. do not buy! This sample is complete but lacks depth. It is the noise level to a synthetic type keyboard roland jv / xp or some EMU samplers Series E.
It is clear that the sounds are platonic solo but someone who knows how to fine tune and with a playing technique quite pro can remove something pretty impressive I would say. Although the sound is "crap" at the base, I can not contradict the qualitative result of a sequence worked well. Do not forget that kinesthesia provides the music, so not too much focus on the aspect of sound quality, indeed it's not just the ear that is sought in music ... ! Pb no installation, and it's not a big soft anyway, so no complications. No pb with the stability vst - The management of the 16 MIDI tracks and the machine is simple cash fine. Brief start (or use "amateur" is in my opinion a perfect soft, low resource PC inexpensive, easy to implement and use, even if the medium to long term it quickly want something more realistic, more convincing. But I do songs with bcp and I regret nothing. For "everyman", the sound is convincing and leaves a good listener. Good value for money . For extended operation, and / or a trained ear, forget and move on to more "serious". 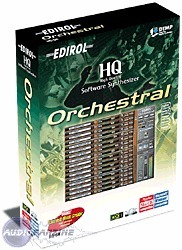 Edirol has chosen to make a vsti of orchestral sounds: one of the biggest brands in the synthse tried to find a place in the market with Edirol Orchestral Symphony. The fault, however, is THE FIRST: If the PSE does absolutely nothing vsti (150MB I think? ), It has nevertheless a major default in relation to the samplers: the ism. Or if something good concert rclament most is the authenticity. If the ear mdiocre the most people will sometimes vritable an orchestra, a little attention left immediately see that the sounds are purely synthetic. If your goal is to compose a way that ca not rowing is a trs good choice, but at ism not worth Iren. The thing that is of no use: some freeware will better Contents of chorus and reverb. So if there's one thing that is really chi .. is the absence of keyswitch: it is necessary to open noon to 5 tracks one instrument, because it takes for a STACC, one for legacy, for pizza, etc., and more must coordinate all this when we made up, and it's really not practical. Of the scam, theft, the plugs would have sold t the ca 50 euros would, but for that price, many other samplers are 20 times better. The default: pourraves sounds too synthetic and lack of kayswitches. Cubase SX2.0 in squenceur host. Prs a year and a half post APRS have three compounds in dmonstrations sound, I m'aperois I did not cry to review this product. It dsormais done. When I bought this product c'tait for me the very first time I rubbed the joys of orchestral sound bank and I must say that I really apprci. For my part, I find some wood and percussion trs well made, even if the same when any lack of "Niack". The strings are not standards but coutable remains, brass, however, are trs ugly, it must be said. Sr is that if we compare orchestral banks such as VSL, the choice is quickly made, but what price?! I recommend this software for beginners as it is easy to handle and it REPRESENTATIVES not too big investment (especially if it is found OCCAZ 100 euros). I do not have that choice would do with xperience, but as a beginners two years ago, yes I would do without this choice problem.